Ms. Pantaleo is Partner to the firm and concentrates her practice on representation of management in all aspects of Labor and Employment Law and School Law. She represents and advises private and public sector employers on the Family and Medical Leave Act, and New Jersey Family Leave Act, the Fair Labor Standard Act, Title VII, the Americans with Disabilities Act, the New Jersey Law Against Discrimination, sexual harassment, wrongful discharge, wage and hour claims, grievances, arbitrations, collective bargaining issues and tenure and seniority matters. 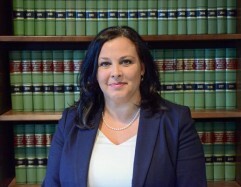 Ms. Pantaleo also provides general counsel services to local municipalities and school boards throughout New Jersey. Ms. Pantaleo devotes a portion of her practice to enforcing creditor’s rights in bankruptcy matters. Prior to joining Cleary Giacobbe Alfieri & Jacobs, LLC, Ms. Pantaleo served as judicial law clerk to the Honorable Robert Feldman of the Superior Court of New Jersey.